This Abcore Junior Abdominal Machine review will be looking at the ab training product in-depth to see if it can help to give you stronger and more defined abs. When trying to get into shape, one of the places that most people will start, is with the abs. Ripped abs clearly communicate a low bodyfat percentage and a powerful and strong core. It makes you look athletic, toned, and much more attractive. If there’s one muscle group that is synonymous with being in great shape, then it would have to be the abs. So how do you go about getting great abs? If you’re like a lot of people, then you’ll probably go about it by doing lots of sit ups and lots of crunches. This might sound like a good idea, but unfortunately it’s going to get you nowhere fast. Why? For starters, this type of ab exercise includes very little ‘resistance’. In other words, your abs are only taxed with lifting the upper portion of your body, which is pretty light. They do this all the time anyway! And so you’re really not going to be stimulating your abs enough to grow. At the same time, most people who perform lots of sit ups or crunches will do so while mainly activating the hip flexors – the tiny muscles that we use in order to lift our legs straight up. In other words, they aren’t properly targeting the actual abs. As such, they don’t create the stimulation where it needs to be and they don’t see the changes that they want to change! So, how does the Abcore Junior Abdominal Machine go about fixing these limitations? Read on and we’ll explore what it can do. This is an abs resistance machine that works very similarly to the kinds you might find in the gym. That is to say that you will sit upright on the chair to start with, and then grab hold of handles on either side of your head. From there, you’re going to bend forward, making sure to roll your abs as you do, thereby pulling against the handles and providing the tough resistance for your core. What might surprise you when you do this for the first time though, is that unlike many more static ab trainers, this machine will actually also rock in the middle and cause you to bring your knees up to your chest. This is similar to a movement that is known as a ‘frog kick’, which is often performed while hanging from a pull up bar, or while suspended by a dipping station. Either way, the design is such that you’ll involve more of your stomach and create a real crunch. This is the first advantage of using a machine like the Abcore Junior Abdominal Machine if it is well designed: it is going to force you to go through the specific movement necessary in order to challenge the abs, rather than potentially using the wrong technique and not getting results. Keep in mind that the abs are there at least in part to prevent you from completely folding backward against the force of your erector spinae and other posterior chain muscles. In other words, it is capable of moving through quite a large range of motion and if you’re just tipping your upper body, then you are properly challenging your core like that. Now you’re challenging the upper and lower abs simultaneously. This also has the added benefit of being designed to reduce any strain on the lower back – thereby making this a safer option for anyone with back complaints. Sitting on the Abcore Junior Abdominal Machine for the first time, you should find that it is comfortable and that it has an ergonomic design that fits well to your shape. You’ll also find that it is a well constructed unit that feels sturdy and stable and that won’t rattle around while you’re performing repetitions. This machine is fantastic at properly targeting the upper and lower abs then, while nicely leaving the lower back out of the equation. It’s comfortable and safe to use, but it does a real number on the abs that you are trying to train. For those reasons, it’s a great machine. At the same time though, it also has some other great options. 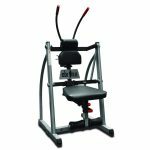 For one, you have the ability to add additional weights to the back of the machine and thereby increase the resistance. This is important as it means the abs are going to be working even harder through the movement and this will create the microtears and the stimulus necessary for growth as mentioned earlier. At the same time, this machine also has the an option to alter the angle so that it will better target the obliques. These are the muscles on either side of six pack, used in order to torque, brace, and bend sideways. This can add a lot of extra detail to your mid section, not to mention providing you with more options for how you want to train. There’s not much to dislike here. 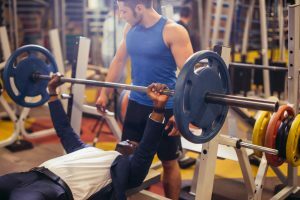 The maximum capacity of 240lbs is relatively low, and it’s a shame you can only add up to 50lbs of weight on top of what’s there (this will only be a problem for more experienced gym-goers). Other than that though, this is a fantastic machine for training abs. This is a well designed ab machine that perfectly targets the upper and lower abs in an effective and safe manner. It is comfortable and fun to use and has lots of options and settings to provide a diverse range of core workouts. This Abcore Junior Abdominal Machine review is a hearty recommendation!